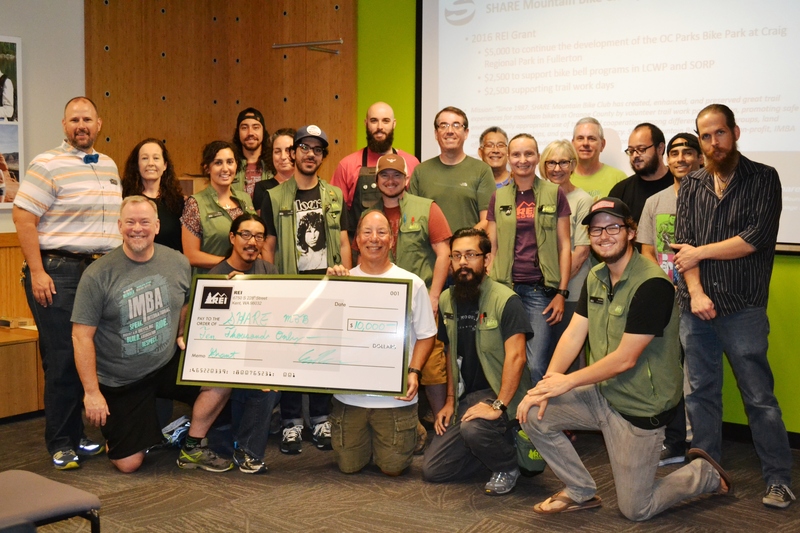 SHARE Mountain Bike Club of Orange County is excited to announce that REI has donated $10,000 to the club. SHARE Mountain Bike Club of Orange County works to partner with the Orange County Parks Department and the International Mountain Biking Association on projects to enhance the quality and diversity of trails in Orange County. Our 2016 projects adds critically needed tools to complete over 20 trail work days per year to maintain, improve and create great places to hike, run and ride on over 20 miles of trail. In addition, SHARE is working on two local bell programs in Laguna Coast Wilderness Park and Santiago Oaks Wilderness Park to enable mountain bikers with warning bells to improve public safety and minimize trail user conflict. Lastly, a long term objective in Orange County is to construct a bike facility within Craig Regional Park in Fullerton, California. The proposed OC Parks project will create a non-motorized 10 acre bike park facility benefiting all ages, abilities, and skill level of mountain bikers. 1. Urgently needed trail work tools. Recently, SHARE‘s trail work days have gotten a lots of participation and SHARE needs more trail work tools and supplies; 2. purchase bells for the new bike bell programs in LCWP and SORP; SHARE has completed purchase of 400 bells used in LCWP and will be purchasing another 1500 to support the bell programs; and 3. Continue the development and contributions to Craig Park Bike Park. SHARE has reserved $2500, $2500, and $5000 for these project respectively.